The Honeymooners is the primal domestic sitcom: one basic set, no production values, no big-name guest stars, no cute kids or animals, and barely a supporting cast. For many years, when I Love Lucy was the all-time syndication champ and the defining image of ’50s TV nostalgia, The Honeymooners was regarded affectionately as the crazy uncle living in the attic. Reruns tended to be slotted in the late-night nooks and crannies of local stations’ broadcast schedules, where the show’s low-budget realism took on a dreamlike cast, like a transmission from a distant, tackier world. Its fans took pride in being part of a bona fide cult, but at some point, it began to look less like an anomaly than like the beginning of something. In the ’80s, post-punk artists such as filmmaker Jim Jarmusch began to cite the show, with its minimalist aesthetic, as a cultural totem and an influence. The series went through many permutations. It originated as a recurring sketch on Cavalcade Of Stars, a variety show on the DuMont Network, a pioneering commercial television network that shut down in 1956. Jackie Gleason took over as host of the show in 1950, and it made him an instant star, after a failed movie career and his dismissal from the lead role on the sitcom The Life Of Riley. The sketches starred Gleason as eternally frustrated bus driver Ralph Kramden and Pert Kelton as his wife, Alice. Art Carney, who had a bit part in the first sketch as a cop, was soon added to the roster as Ralph’s best friend and neighbor, the happily brain-dead sewer worker Ed Norton. Joyce Randall took over the role of Norton’s wife Trixie from the young Elaine Stritch, who played it just once. 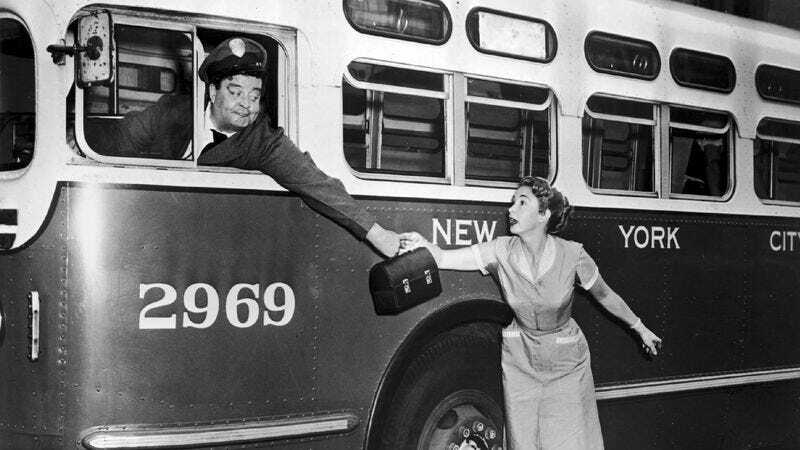 By 1955, the popularity of Ralph and Alice and Ed and Trixie had so overshadowed everything else on Gleason’s variety show that he and CBS decided to cut them loose from the mothership and create the Honeymooners half-hour sitcom. And yet around this time, Gleason’s popularity peaked, and The Honeymooners was canceled after a single, 39-episode season. Gleason, in a long string of series and specials, kept returning to the variety-show format, and as late as a 1973, he still did the odd “Honeymooners” sketch, depending on Art Carney’s availability. But after the “Classic 39,” the only occasions when Audrey Meadows returned to play Alice were in a 1966 musical special based on the classic episode “The Adoption,” and four reunion specials broadcast in the late ’70s. The low point came in 1966, when Gleason, having shifted his base of operations to Miami, persuaded Carney to join him for a series of musical Honeymooners episodes with a traveling-through-Europe theme. The Kramdens and Nortons were now financially upscale, the actresses playing their wives were younger, and that poor, dead horse was being beaten into the ground. Basically, there is no Honeymooners without Gleason, Meadows, and Carney. (This is not intended as a slam against Joyce Randolph, but there are too many classic episodes in which she doesn’t appear at all for her to be lumped in with the essential trio.) Gleason, who longed to be considered an all-around multi-talent on the scale of Orson Welles or Charlie Chaplin, had a more-is-more philosophy that most of his variety show embodied, but the one thing about The Honeymooners that’s lasted has been the way the show kept things small-scale, but got them just right. Although the show was made in a state of barely controlled chaos, partly because Gleason didn’t like to rehearse, and on-air flubs and missed cues were common, it remains one of the most beautifully acted shows of its kind. That’s no surprise in the case of Carney, a phenomenally gifted, hard-working character actor (and legendarily nice guy) who went on to create the role of Felix Unger on Broadway and won a well-deserved Oscar for starring in the 1974 movie Harry And Tonto. But Gleason was essentially put on Earth to play Ralph Kramden. Gleason, who acknowledged modeling the Kramdens’ Brooklyn apartment on the one where he grew up, and even gave them his old address, once said, “I knew a hundred guys like Ralph Kramden in Brooklyn.” Critic J. Hoberman, comparing Ralph’s existence to the details of Gleason’s early life and that of the father who walked out on the family when Jackie was 14, asked, “Is it a hundred guys he is playing, or just one?” It’s easy to see Ralph as Gleason’s idea of where he might have wound up—and where, in the early days of his TV success, he must have feared he might yet wind up—if this show-business thing didn’t pan out. The only time Gleason loomed as large in a movie as he did on The Honeymooners was in The Hustler when he played Minnesota Fats, the legendary poolroom shark who has secretly given away his soul and autonomy to the gambler who holds his bankroll. “TV Or Not TV” (season 1, episode 1): The first episode carries over a theme the variety-show sketches had already explored: the idea that the ultimate new status symbol and household necessity is the object you folks at home are watching this on. Unable to afford a TV set, Ralph persuades Norton to go in halfsies on a set the two families can share. You can see where this is going. “The Golfer” (season 1, episode 3): To impress his boss, Ralph decides to learn to golf. This episode is a minor legend based on Norton’s golfing tutorial, a scene that gives Art Carney a chance to demonstrate his peerless ability to appear balletic and gawky at the same time. “A Woman’s Work Is Never Done” (season 1, episode 4): It might be a stretch to call The Honeymooners “feminist,” but no other show of its time made such brutal fun of a man for not understanding that his wife wasn’t kicking back and eating bonbons all day while he was out bringing home the bacon. Meadows’ aria about “what a joy it is” to spend every minute she has to herself trying to keep the couple’s shithole apartment livable is a series high point. “Better Living Through TV” (season 1, episode 7): Another TV-themed episode, this time with Ralph and Ed stepping in front of the camera to do a live commercial as part of one of Ralph’s get-rich schemes. The rehearsal and filming of the commercial (which includes an amusing blooper and face-saving ad lib) has some claim to being the single funniest sequence in the show’s history. “The Deciding Vote” (season 1, episode 11): In this heart-wrenching episode, Ralph and Ed’s friendship is severely tested due to the internal politics of their fraternal order, the International Order Of The Sons Of Friendly Raccoons. Regarding the claim made above regarding “A Woman’s Work Is Never Done,” take note of the slightly chilling moment here when Ralph, who has brought home a vacuum cleaner, yells at his unappreciative wife, “Remember, Alice, I got this for your pleasure, not mine,” and no one in the audience laughs. “A Matter Of Record” (season 1, episode 15): A visit from Alice’s mother precipitates a fight so bad that Ralph is reduced to doing the nearly unthinkable: apologizing. Some people, trying to figure out how an unlikely-seeming couple ever got together, have been known to fall back on the theory that some women feel driven to marry their fathers. To judge from the mouth on her, Alice felt driven to marry her mother. “The $99,000 Answer” (season 1, episode 18): Ralph crashes into TV Land again, this time as a contestant on a game show. This is a steadily rising soufflé of an episode that builds to a triumphant punchline. “On Stage” (season 1, episode 31): Ralph is cast as the lead in a play. This requires him to rehearse his lines, which leads him to seek help from Norton, which results in a character-defining mispronunciation from Art Carney. “The Bensonhurst Bomber” (season 1, episode 37): An extended break from the Kramden apartment provides a glimpse into the pool-hall world where Ralph and Ed take their recreation. Naturally, Ralph only needs a few minutes there to find someone who wants to knock his block off. And if you like those, here’s 10 more: “The Sleepwalker” (episode 6), “Pal O’ Mine” (episode 8), “Brother Ralph” (episode 9), “Ralph Kramden, Inc.” (episode 19), “A Dog’s Life” (episode 21), “Here Comes The Bride” (episode 22), “Young Man With A Horn” (episode 26), “Head Of The House” (episode 27), “The Safety Award” (episode 34), “Dial J For Janitor” (episode 38). Availability: The classic 39 are available on DVD, as are the “lost episodes,” and, for masochists, the “color Honeymooners” of the late ’60s. If you don’t know the show, there are plenty of YouTube clips you can use to whet your appetite. Up next: Zack Handlen picks the 10 episodes worth beaming up from one of the most influential science-fiction series ever, Star Trek.